Innovation is at the heart of all great companies. It’s what propelled them to where they are and the reason they continue to grow and thrive. For others, internal processes, thin margins, and a focus on the short-term keep them from putting an emphasis on innovation—even as they recognize the often urgent need for it. Innovation for Growth: Strategies for Creating Value will help you jumpstart your company’s innovation process, providing a full-spectrum, strategic view of innovation and organic growth. You will learn rigorous methods and fresh approaches for identifying new and different growth opportunities, and leave with a roadmap for building innovation capabilities, fostering a culture of continuous innovation, securing resources, and mobilizing to grow faster. Innovation for Growth shares how to build a solid business case for innovation opportunities, says Academic Director George Day. Emphasizing the essential role of innovation in driving business growth, this program focuses on four key pillars: developing leadership and talent, encouraging risk taking, hearing the voice of the customer, and aligning rewards and recognition. Together, these pillars channel the energy of the organization toward the right actions to take, whether you are a growth leader seeking to stay ahead or a growth aspirer trying to catch up. Throughout the program, faculty members share the latest innovation strategy knowledge, tools, and frameworks. They draw on examples of successful firms with environments that foster a more collaborative, creative, and risk-taking culture — where even failure is viewed as an opportunity to learn. Tapping into the experiences of organic growth leaders such as Starbucks, Genentech, Alibaba, LEGO, and Salesforce.com, you will better understand how they generate superior customer value and shareholder value through their innovation prowess. Key takeaways from Innovation for Growth include how to profit from the uncertainty of innovation by spotting opportunities sooner, investing in real options, opening up innovation processes to partners, and adopting start-up methods such as rapid prototyping and crowdsourcing. Participants will also create a growth-affirming narrative to motivate the organization and emphasize the centrality of innovation. Through highly interactive lectures, exercises, and case studies, both in the classroom and in smaller work groups, this deep dive into the process of innovation will leave you with a new level of understanding. You will learn that consistent, powerful growth depends on constantly challenging current thinking about customers, technology, and your business. Overall, you will learn how to develop a growth strategy that guides all innovation activities within your organization. This foundational program is complemented by Mastering Innovation: From Idea to Value Creation and Business Model Innovation in the Digital Age, both of which focus on specific aspects of the innovation process rather than on a full-spectrum, strategic view. Watch the video: Professor George Day on the innovation process. Innovation for Growth is designed for business leaders or leaders who are responsible for driving top-line growth and promoting market innovation — including strategy leaders, managers of new businesses, chief innovation officers, chief technology officers, and product development leaders. Participants leave the program with an expanded peer network, plus specific tools and frameworks they can use to make a meaningful impact on the way they approach innovation within their companies or organizations. The Innovation for Growth class was phenomenal — it not only triggered my thought processes, but it also let me walk away with an excellent tool kit that includes Innovation Tournaments. Most people think innovation only comes from a certain area. I found that more innovation can be driven from not only from a specific area but from all parts of the organization. When everyone is involved in the process, the outcome is much richer. Joyce LeeExecutive Vice President, Area President, Zoetis, Inc. 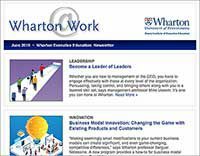 When I was looking at programs related to innovation, Wharton’s program, Innovation for Growth: Strategies for Creating Value, caught my eye. 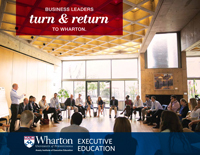 The program’s curriculum and Wharton’s reputation made it an easy decision. The program was laid out very well — it helped me realign my thoughts about innovation. Before I went to the program, I thought innovation was identifying the next big thing — like Steve Jobs did at Apple. Wharton made it clear that it’s more of a process than a single ah-ha moment. If you follow the process, the likelihood of having 10 ah-ha moments is much higher than having one. A second misconception I had was that every idea needs to be big enough to be meaningful. That’s not the case. Every innovation portfolio needs a combination of small, medium and large innovations, rather than focusing just on the large innovations because the risk is much higher. The innovation course provided me with several key insights that have been useful in filling out our innovation pipeline. We have been able to invigorate mature products with fresh, new looks at markets where they might be utilized. As a result we have an entire new business area. The tools brought back from the Innovation program were critical to identification of these peripheral opportunities. We were missing some obvious opportunities! !